When your warning light for your transmission is showing up on your dashboard, it’s time to stop and let it cool for a while. Automatic transmission failures are usually as a result of overheating. The main culprit for this is low transmission fluid. The normal transmission temp is 175 degrees but with overheating it could rise to over 240 degrees. This then leads to hardening of seals, and they soon start to melt slowly. At 260 degrees your plates will slip, and any further increase in temperature leads to clutches burn out, and your transmission fluid will form carbon. It is vital that you constantly monitor the normal transmission temp to help your transmission have a longer lifespan. The gears inside the transmission rub against each other, and this result in a lot of friction being generated which turns to internal heat. Every time the transmission temperature rises above the optimal level the lifespan of the transmission is cut rapidly. 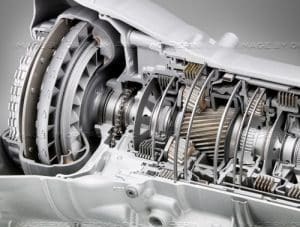 The ideal temperature for an automatic transmission is around 175 degrees. Cars do often have the coolant for the engine as a heat exchanger for the transmission fluid and therefore, they will often hold the same temperature if you are driving it normal. However, if your transmission is slipping a lot or you are pulling something heavy, the coolant may not be enough to cool the transmission efficiency and the temperature may rise drastically to temperatures over 240 degrees. The older automatic transmission may not use coolant lines to the transmission, and these are even more sensitive to high loads. Most cars do not have an external temperature gauge for the automatic transmissions fluid. Instead, they are using a warning light or the check engine light to show up when the transmission is overheated. An overheated transmission can also cause the engine to go into limp mode to lower the risk of overheating. There are some different reasons why your transmission may overheat faster than usual. Here is a list of the most common ones. If you are using old and worn transmission fluid your transmission can slip more than usually. If you drain out the fluid and you notice that is has developed a dark color and has lost its viscosity, it’s definitely time to replace it. The fluid can get contaminated with time, and this affects its operation. You should immediately drain the old fluid and purchase synthetic fluids that are thought to last longer. 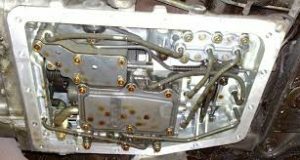 The solenoid plays a critical role in regulating transmission fluid flow. When it is defective you have less of the fluid flowing to the transmission, and this can cause overheating. You may need to evaluate the circuits in the solenoid to determine whether it can be fixed or you need to purchase a new one. You need to check your transmission fluid with a dipstick sometimes. If the levels are low, increase the amount. Avoid mixing fluids from different manufacturers. When the fluid is low, you are going to experience a slipping converter, worn out gears and may even damage other expensive parts. Transmission slipping is often a result of low fluid levels. A faulty converter can cause the transmission to slip even more, and therefore creating extra heat to the transmission fluid. If you are towing something heavy, you are going to put more pressure on the transmission. This is because more torque is required to move the extra load. After some time you will notice that the normal transmission temp has increased. If you live in an area experiencing hot climatic conditions you will experience rising temperatures with your transmission. The fluid will heat up causing the rise. Those who live in the city tend to travel short distances, but city traffic causes many jams. The stopping and rapid acceleration over short distances can cause transmission temperatures to rise. What happens when a transmission overheats? When the temperatures rise above the normal transmission temp, the transmission fluid will lose its viscosity, and this causes it to oxidize. The fluid varnish starts destroying the internal components of the engine like the valves. By the time the temperatures reach 250 degrees the rubber seals have started cracking and leaking pressure and liquid. At over 290 degrees the transmission will often have stopped working due to damaged parts and seals. The first thing you need to do is to check the color of the transmission fluid. Normal fluid is red in color but with continued use and coming into contact with contaminants it does turn to a dark red color. You can also view your transmission gauge to know when it gets hotter than normal. The transmission fluid should be changed every 30,000 to 60,000 miles. However, if you drive in hot climatic conditions, you may be required to change it sooner. Also, avoid overloading your car as it puts pressure on the transmission. If you are looking for more efficiency from your transmission, you may consider adding an external deep pan. This allows you to use more transmission fluid – especially for those living in hot climatic conditions or carrying heavy loads. The best deep pans are those made from aluminum because they dissipate heat faster than those made from steel. Consult your mechanic before purchasing one because they have more knowledge on the most suitable for your car. The coolant is vital for cooling the car’s transmission. Ensure that your radiator is operating optimally and there are no hosepipe leaks. In case you plan on hauling heavy loads have an external cooler integrated with the current system. Do not be shocked when the temperature gauge rises above the mid-point when the air-conditioning is at maximum, when you are towing another car or during hot seasons. If it starts rising you can stop your car by the roadside and let the engine cool for a while. Later check your coolant levels and make additions when necessary. You can also possibly have air in the coolant lines or blocked lines to the transmission, which is causing it to not cool efficiency. If this persists, then you may need to have the car’s cooling system checked. Modern cars with advanced electronics do not usually come with a temperature gauge. Instead, they have an electric display of temperature.